When you’re just driving by, they all look pretty much the same. When you look a little closer, you find each of the state’s 236 historical markers tells a unique story. In this series, Michael Brindley tells some of those stories. New technology is giving history buffs an easier way to tour the Granite State's past. 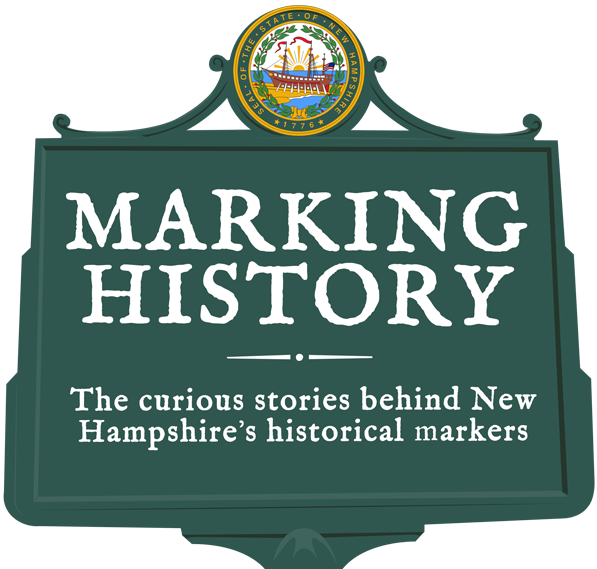 The New Hampshire Division of Historical Resources this week launched a new, mobile-phone friendly map for its historical highway marker program. Elizabeth Muzzey, director of the Division of Historical Resources, joined NHPR's Morning Edition to talk about how it works. For a 31-year period in the 19th century, glass making was the heart of the economy in the small town of Stoddard. Factories there made everything from whiskey flasks to ink wells and at their peak, each produced a million bottles a year. Pieces of Stoddard Glass have since become highly collectible and highly valuable antiques. As part of our ongoing series, NHPR’s Michael Brindley visits Stoddard and talks with historian Alan Rumrill about glassmaking in the town and how much the rarest of the Stoddard glass pieces are worth today. New Hampshire is known for many things, but it holds a special place in the world of the extraterrestrial. He was founder and editor of the New York Tribune and an outspoken abolitionist. He was also a politician, serving briefly in Congress. But before all of this, he called New Hampshire home; more specifically the town of Amherst. Those driving along Route 101 will see a historical marker noting that Greeley was born in the town in 1811. The roots of the Industrial Revolution in New Hampshire can be traced back to the small town of New Ipswich. That’s where the first textile mills opened in the Granite State in the early 1800s. As part of our continuing series, Marking History, NHPR’s Michael Brindley travels to New Ipswich to tour Warwick Mills, the site of the oldest operating textile mill in New Hampshire. The Seventh-Day Adventist Church is a denomination known primarily for its keeping of the Saturday Sabbath. It’s grown to 18 million members worldwide, and its birthplace is in the town of Washington. It was in the mid-19th century when the Adventist movement first began to form in the small New Hampshire town. When it was built in the 1936, the Nansen Ski Jump was the largest steel ski jump east of the Mississippi River. Located in Milan, just north of the Berlin city line, the jump can still be seen by those driving along Route 16. And while it’s fallen into disrepair since it was last used in the 1980s, the jump itself is full of history. It was used for the first Olympic Trials in 1938, and hosted the U.S. Ski Jumping National Championships in 1940, 1957, 1965 and 1972. Andover is home to the village of Potter Place, named after Richard Potter, a famous magician and ventriloquist. And it’s in this village where the town’s Potter Place railroad station still stands. The town’s historical society maintains the station. It was located on the Northern Railroad, which ran from Boston, through White River Junction, and continued to Montreal. New Hampshire’s northernmost historical marker is also the state’s oldest. Originally a toll road, New Hampshire’s first turnpike stretched 36 miles, from the Piscataqua Bridge in Durham to the Merrimack River in East Concord. It was the first of more than 80 turnpikes built in the state by private corporations during the 19th century. As part of our occasional series, Marking History, NHPR’s Michael Brindley travels to Route 4 in Northwood, where there’s a historical marker paying tribute to the state’s transportation milestone. Built in 1800, the Meetinghouse in Fremont was used for both town and church meetings. The nearby Hearse House was built in 1849. As part of our occasional series Marking History, NHPR’s Michael Brindley visits the historical marker in Fremont commemorating both buildings and talks with a local historian about what makes them unique. Thomas discusses the slave pew located in the northeast corner of the second-floor gallery. Fremont has four other historical markers, including two about famous riots. At 449 feet and five inches long, the Cornish-Windsor Covered Bridge spans the Connecticut River, connecting the town of Cornish and Windsor, Vermont. Now in its fourth incarnation, the first three versions of the bridge were all destroyed by floods. As part of our occasional series Marking History, we travel to Cornish, where we talk with a local historian about a bit of controversy over its ranking as the longest covered bridge in the country. There's also a fun rivalry between Cornish and Windsor about the name of the bridge. But Elizabeth Muzzey, who directs the state’s Division of Historical resources, says when you look a little closer, you find each of the state’s 236 historical markers tells a unique story. There’s one in New Ipswich marking the first textile mill.